Description: * LCR-T4 graphic multifunction tester resistor capacitor diode SCR inductance Transistor mos tube. * LCD is liquid crystal display with backlight, the backlight color is Green. * Automatic detect NPN and PNP transistors, N-channel and P-channel MOSFET, diode (including dual diodes), thyristors,transistors, resistors and capacitors and other components. 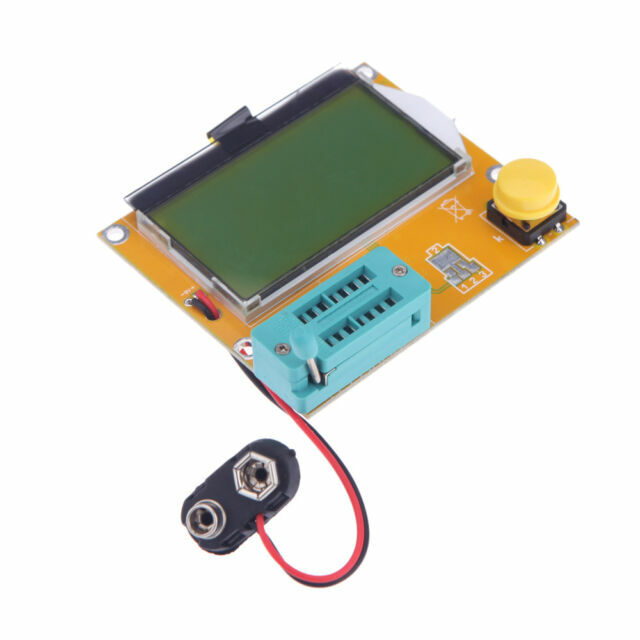 * Automatic test the pin element and the display on the LCD. Specification: Product Name: Transistor Tester Material: Plastic,Metal Power Consumption Off Mode: Less than 20nA With Automatic Shutdown. Resistance Measure Range: 0.1ohm resolution, maximum 50M ohm Capacitor Measure Range: 25pf -100000uf Inductors Measure Range: 0.01mh-20H Power: 9V battery (If long power, you can use pack consisting of two 8.4V lithium battery) PCB Size: 72.6x60.2x1.2mm/ 2.86x2.